When building a fence in a windy area, there are several types to consider. 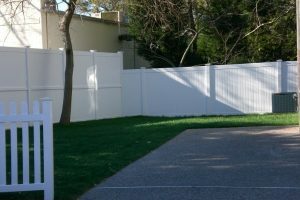 When considering a new fence, there are a lot of factors you must take into consideration. Along with material, height, and color you need to take a look at local restrictions and even local weather patterns. If you live in an area that gets a lot of rainfall, the type of fence you are likely to get will differ from someone who lives in high heat or windy area. High wind can be particularly difficult to plan for as it requires that your materials and design work together. When building a fence in a windy area, there are several types to consider. One of the most important factors when building for a windy region is to ensure that there is plenty of space for air flow. This rules out traditional privacy fences, but with a picket fence, you can use a shadow box method to get a similar effect. Any type of fence that allows for air to pass through unimpeded will work well. When it comes to material, metal fencing like iron, wrought iron, and chain link have the advantages of being heavy along with their better air flow. Most designs made with these materials offer a lot of open space; chain link is particularly good for better airflow. Chain link fences are also incredibly cost-effective and long-lasting. They may not be the most appealing, but they’re an excellent option for a lot of different circumstances. When it comes to both wood and vinyl fencing, there are advantages and disadvantages to each. Wood can be durable and allow for decent airflow, but often wooden fences are not great with the wind. Vinyl is considered to be about five times stronger than wood and usually is designed in a way that allows for decent airflow, but it can be very light so if it does break it might blow away. This entry was posted on Friday, December 7th, 2018 at 9:11 am. Both comments and pings are currently closed.